The Verona Herringbone harness is inspired by the metropolitan city in Italy, which is the third largest in the northeast known for it’s artist heritage and opera lyrical season in the ancient amphitheater built by the Romans. Also known as the broken twill weave, the herringbone, carries a distinctive V-shaped weaving pattern usually found in twill fabric and is distinguished from the plain chevron by the break reversal that resembles a broken zigzag or bones of a herring fish, where the name originated from. 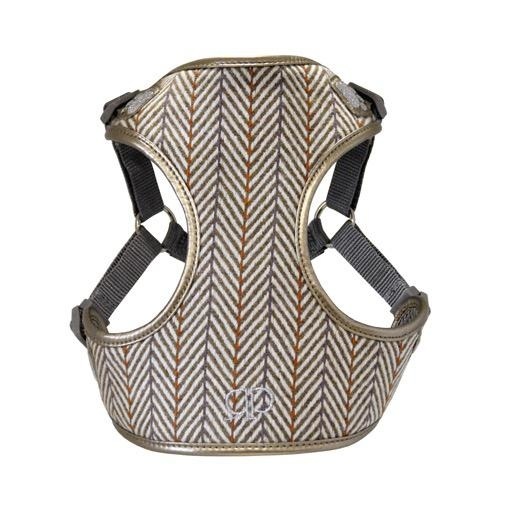 This intricate design is surrounded with bronze metallic leatherette ribbing accented with rich silver embroidery to capture a prominent, sophisticated look and the textile is composed of earth-tones shades hued in sheep’s wool in correlation with the spirited herding dog.